Kindle loves this project because... the Downtown Boys are punk band with heart, depth, wisdom and a seriously important political message. They make spaces safe and they engage with their audiences not because they are fans because they are community members. Their writing here shows that this touring band is so thoughtful about the alchemy they have with their audience and all the while, they are a PUNK BAND! 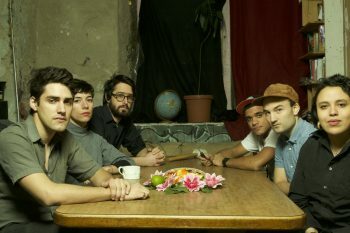 They are true risk-taking wave-makers and are unlike any other group of artists we've come across. Thank you Downtown Boys for speaking the truth with power! The role of platform for an artist, political figure, or really any athlete is an opportunity. 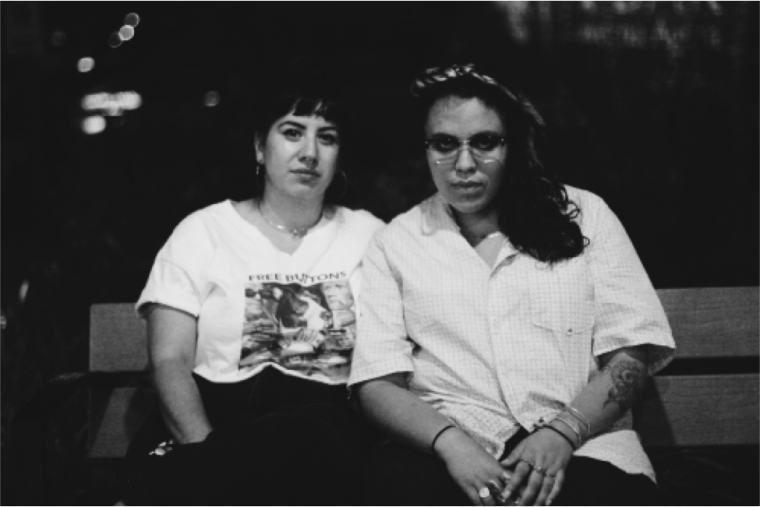 Since our inception, Downtown Boys has always elected to use whatever platform we can in order to connect with people using culture as a weapon. We know that any time you bring a group of people into a room, there’s gonna be the same power dynamics that are happening outside of that room. And by no means do we have an expectation for it not to be. We want to play to a cross section of what reality is rather than to some hyper-curated group. Because we’re a traveling band—which not all bands are—we’ve traveled the country a couple of times. We play so many cities, and we’ve seen in one or two cities like McAllen, Texas or Oakland, California where we are playing and actually looking at people who look like us, and it’s so rare. Even in New York, people of color fight to come out to our shows, and fight for the front, but New York is so big and it’s also so gentrified. So the few shows where we see people who look like us, it’s so incredible, and we’re like, ‘this is reality for a lot of people.’ But ultimately, we know that that’s not how it is in a lot of the scenes that we’re playing in, and a lot of the cities that we’re in. So it’s an amazing thing when you’re playing to 200 black and brown people, but by no means is that an expectation, because we know that’s not a reality of the DIY scene. We absolutely try to confront the same power dynamics that are happening outside of the show inside of the show. One of the ways we do that is through using our platform to demand change, since our platform and our shows are our means and we will use our means as we think is most necessary. We would love to take this chance to highlight three very distinct and different platforms that we have played in the Fall 2016 leading up to the Presidential Elections and some quotes from interviews about the shows. People might now know this, but we are often driving for hours on end, getting to a venue or show location, setting up to play and then we use the time between to talk to people. We try to engage people coming to shows, figure out the political and social climate of where we are performing to the best of our ability, to not give anyone a canned show. One of the ways we do this is taking advantage of interview opportunities and working with show goers, writers, and other participants in the music scene who believe that culture is a mechanism for pushing the limits of the status quo. 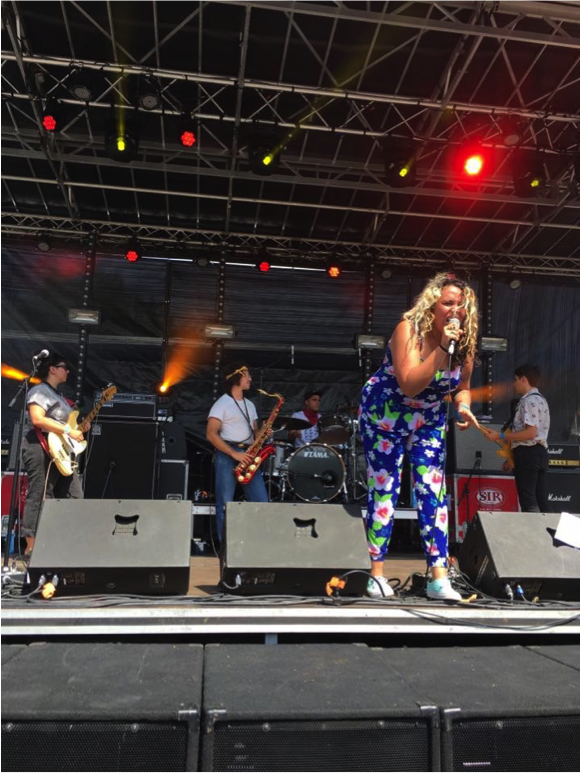 One of the shows we playing in August of 2016 was AFROPUNK. They asked us about what it meant to be playing political music. The festival featured so many artists, mostly artists of color and was based in Brooklyn. This is an excerpt from our interview with AFROPUNK. Chicago/Milwaukee based webzine that celebrates art. 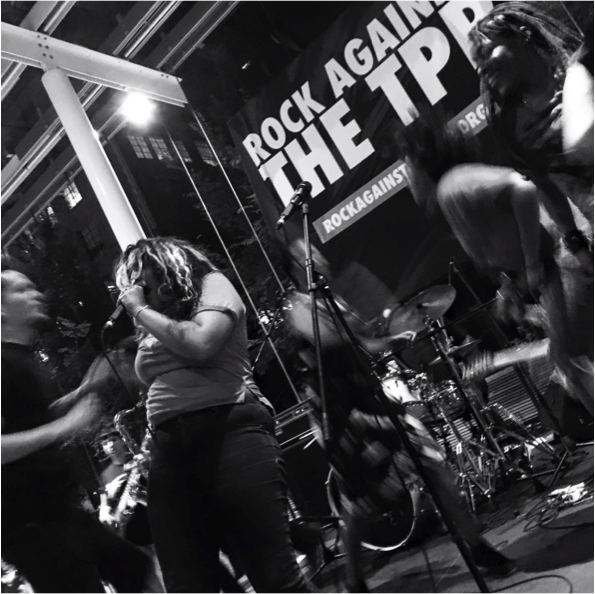 Unique from Hopscotch and Afropunk are a set of shows we played called, “Rock Against the TPP.” Labor and community groups spearheaded by Fight for the Future came together to fight against the Trans Pacific Partnership. 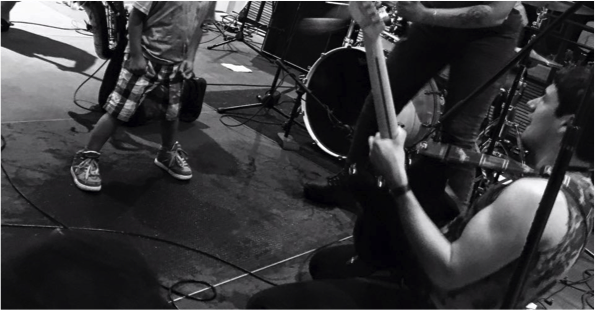 It was very exciting because we got to play with amazing people a rapper name Son of Nun and Tom Morello of Rage Against the Machine! More than anything, we were able to stand up against a trade deal that would be socially and economically terrifying. Seeing the country and meeting so many people throughout the history of this band has afforded us tremendous opportunity. With the advent of a Trump Presidency and a huge increase in risk for so many immigrants, Muslims, People of Color, people with criminal records, poor people, and LGBTQ people, we will continue to tour and play shows and take space for messages of justice. We are close to finishing a new album. All the songs are relevant to confronting the injustice that the white supremacist president-elect represents, but to be honest, they would also be relevant to confronting the injustice Hillary would have represented as president. I think that’s because the music is not meant for the dictator, the boss, the creator of neoliberalism, the deporter-in-chief – the music is meant for everyone else. I think our music will continue to play an offensive game with culture rather than a defensive one. We don’t have to defend white culture and we don’t have to defend fear about being brown; we have to take space, we have to connect, and we have to change the game, not get held down by the players.